Whittco, Inc. doing business as Hydra-Tech Pumps, a veteran owned small business located in Nesquehoning, PA, was recently awarded a contract by the General Services Administration (GSA). The contract award allows Hydra-Tech Pumps to directly list their products on the GSA Schedule allowing government agencies to buy directly from Hydra-Tech Pumps instead of through a formal solicitation process. 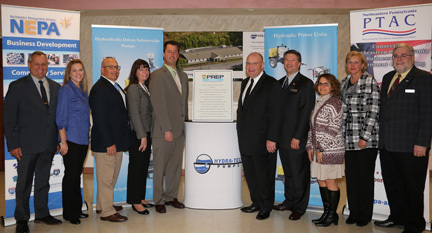 This is a true business development success story for the company and NEPA Alliance’s Procurement Technical Assistance Center (PTAC) team and a tremendous market opportunity for Hydra-Tech Pumps. The NEPA Alliance PTAC staff worked closely with Hydra-Tech Pumps on their GSA application, and has been providing services to them since 2008. Congressman Matt Cartwright also assisted the company with this contract award. Since 1977, Hydra-Tech Pumps has pioneered the development of Hydraulic Drive Submersible Pumps, as well as the continued development of new products to keep pace with today’s changing market needs. Their pumps are designed to cover the widest range of applications in the construction, municipal, petro-chemical, mining, utilities, and marine industries. Bob Morgan, Congressman Matt Cartwright’s District Director, on behalf of the Congressman congratulated Hydra-Tech on the GSA schedule Award. “To be listed on the GSA schedule allows the company to enter new markets – a success for the 16 employees,” stated Morgan. For more information on the NEPA Alliance PTAC programs and services, contact Karen Ostroskie or Frank Migneco at 570-655-5581.